Borough Hall is located at 12 East Baltimore Ave, Lansdowne, PA 19050. Phone: 610-623-7300. Lansdowne Borough was incorporated in 1893. The Borough contains 2 National Register Historic Districts: Lansdowne Park, and the Henry Albertson Subdivision. Also on the National Register are the Twentieth Century Club (circa 1911, 84 S Lansdowne Ave) and the Lansdowne Theatre, (circa 1927, 29 N Lansdowne Ave). Median age of single family residences is circa 1939. Approximately half of the residences are semi-detached (twin) homes. Up until the late nineteenth century, the Borough of Lansdowne was a part of rural Upper Darby Township. However, settlement in this area began towards the end of the 17th century. Much of the land was first surveyed for George Wood, grandfather of Jacob Bonsall, in 1682. Around this time, Lansdowne was little more than a crossroads at Lansdowne Avenue (then called Darby Haverford Road) and Baltimore Avenue. In Lansdowne's early days, the Darby Creek attracted men such as Joseph Cruikshank and Morris Trueman to build industry in the forms of textiles, paper, cotton and dye, with the Beehive Mills in 1778 and the Kellyville Mills in 1812. Lansdowne's locale was a center for the florist trade, with successful businesses operated by William Leonard, August Valentine Doemling, and the Pennock family. There was also a small settlement of Quakers associated with some of these early businesses families, quite influential to the founding and development of the community. When the rail lines made their way through the future Borough in the mid/late 1800s, the stage was set for continued development. The addition of a second rail track by the Pennsylvania Railroad in the 1880s assisted in the construction boom by making it easier for wealthy Philadelphians to find retreat in the picturesque countryside. This also helped the rail company's business to expand from the increased transporting of building materials and later, people. Lavish mansions and tourist hotels began to dot the landscape, some of which still exist today having been converted into apartments after World War I. Towards the end of the 19th century, a division was beginning to form between those focused on opportunities for real estate development in what was soon to become Lansdowne, with the agrarian ideals of Upper Darby Township. Progress won, and by the June 7, 1893 incorporation, this new Borough was well becoming a very fashionable commuter suburb for the middle-class, with both residential and commercial growth extending on either side of the railroad tracks. Around the turn-of-the-century, a large number of the homes built were those that give Lansdowne its prominent visual character still cherished today. These are the large Vernacular twins and singles with roomy porches, placed neatly on tree-lined streets. The variety of sizes of early American architectural styles provided an appealing place to live and work. Renowned architects, such as Frank Furness, left their mark on community treasures of homes, buildings and even the train station. The trolley line down Baltimore Avenue in 1902 added yet another attractive amenity, in the form of another link to and from Lansdowne. As Lansdowne continued to gain distinction as a desirable community in which to live, they added schools, parks, meeting halls, civic associations, businesses, churches and a movie theatre to meet the needs of the residents. The built environment, which remains in this Borough, provides a glimpse into Lansdowne's progressive past — one that was clearly centered on the needs of the citizens, who remain committed to their community still today. Lansdowne provides an excellent example of a commuter suburb with a more gradual development history. Growth patterns are evident, starting at the railroad tracks, extending towards the commercial heart at Baltimore and Lansdowne Avenues, and stretching out into variations of residential neighborhoods developed over time. Large mansions and estates have been cleverly adapted into modern-day apartments, and many of the characteristic Victorian homes are well kept, exhibiting the grandeur with which they were originally constructed. Pockets of architecturally similar housing exist throughout the town, from singles to twins to rowhousing. Though Lansdowne seems to have an overwhelming number of Queen Anne Victorian homes, there are many very well maintained Colonials, Tudors, Dutch Colonials, American Foursquares, Federal and Georgian Revivals. The abundance of tree-lined streets and sidewalks offer a feeling of an established and friendly community. This is further supported by the variety of landscapes, including a number of parks and the Darby Creek greenway. 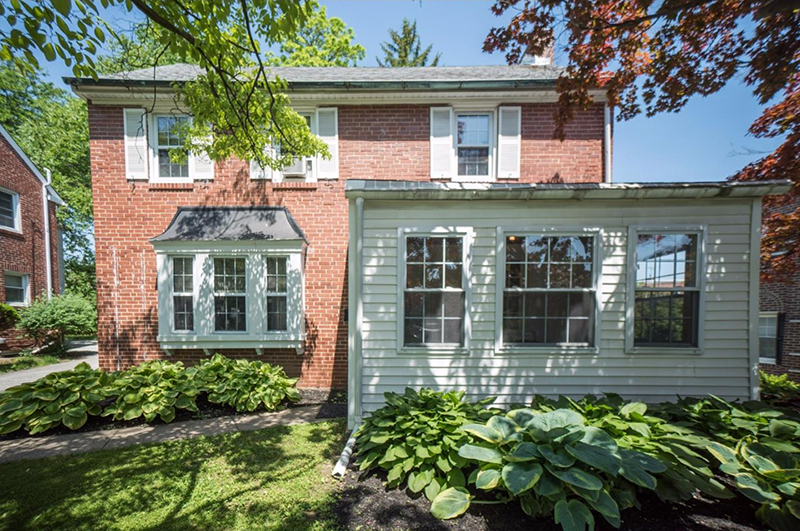 Lansdowne retains a rich historical feel, while providing modern-day suburban living.